If you lived nearby, we’d invite you to pop on over to help us celebrate today’s food holiday: it’s National Blueberry Popover Day! That turned and popped under. We had a three-hour drive home from Seattle today, and then had to make a trip to the grocery store. 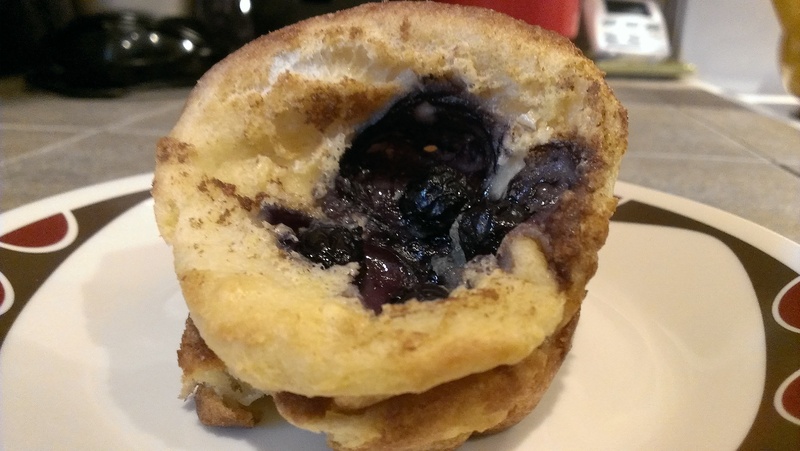 Despite our busy schedule, I still found time to make blueberry popovers from scratch. Yes, me…not Tara. This is huge, because I am not a baker. The chocolate souffle challenge was my first attempt at baking something for the blog, and you might recall I lost miserably to my fiance. I was determined to do these popovers on my own though, and the recipe was pretty straightforward. To my surprise and delight, they turned out very good. Light and airy, with just a touch of sweetness. A little bit of powdered sugar on top brought all the flavors together. I am excited, because this means I can bake!! Preheat oven to 375 degrees. Divide the butter into the 6 cups of your popover pan. (If using a muffin tin, you will need to use all 12 cups. Just divide the butter up evenly.) Place the pan in the oven for 3-5 minutes while you are making the batter. In medium bowl, beat the eggs with the milk, vanilla, and sugar, then whisk in the flour. Pour the batter into the butter-filled cups, then evenly add a few blueberries to each cup. Return to the oven for 5 minutes, then reduce the temperature to 350 degrees and continue to bake for another 25 minutes. Popovers will be tall and gorgeous just out of the oven, but they shrink very quickly. It doesn’t affect the taste. Serve with a sprinkling of powdered sugar and maple syrup. I can bake!! Blueberry popovers are light and airy, and delicious. Impressive! One question…fresh or frozen blueberries? We looked for fresh blueberries, but WinCo didn’t have any so we went with frozen. They were still good!